The NCAA Football 13 demo is now available on both XBL (queue download from web here) and PSN. The demo features one Heisman Challenge match-up (of co-cover athlete Robert Griffin III) and several match-ups from Week 10: USC-Oregon, LSU-Alabama, Kansas State vs. Baylor. All match-ups consist of four three-minute quarters with Studio Updates, however the Heisman Challenge game features four five-minute quarters with defense supersimmed. Sharing the demo with a friend will unlock five Nike Pro-Combat uniforms for use in the retail version of the game: LSU, Navy, Stanford, Boise State, Ohio State. Playing through each Dynasty Experience match-up will unlock WR Tim Brown, RB Archie Griffin, and QB Jim Plunkett for use in Heisman Challenge in retail version. After downloading and playing the demo, share your impressions and feedback here with the community. Continue on to see a video detailing what you can expect in the demo. fast approaching it’s time to talk about this year’s demo. First off, I’m happy to announced that the demo is now available for download, so rather than just hear about the buzz coming out of E3, you will get a chance to get your hands on the game and check out all of the great gameplay improvements for yourself.We are very excited about this year’s demo for two reasons; first, we are giving you a deeper look at what’s new than ever before, and second, we have never provided more rewards for checking out the demo.Before we get into the details, let’s take do a quick overview of the menu and we will dive into the features from there. You will see that we are providing a preview of the new Heisman Challenge, a Dynasty Mode experience, and the ability to share the demo with a friend. Heisman Challenge presented by NissanFirst let’s start with the Heisman Challenge. For the first time ever you will have the chance to experience what it’s like to be a Heisman Trophy winner. 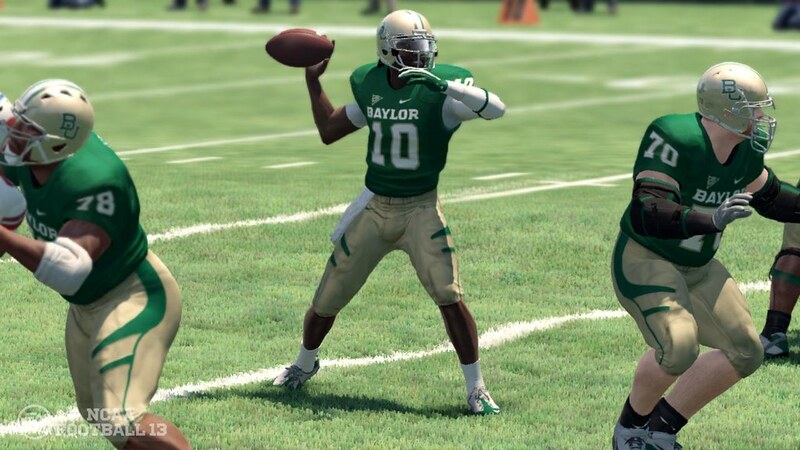 There are 16 former Heisman recipients involved in the Heisman Challenge in the full retail version of the game, but for the demo we are giving you a chance to play as 2011 Heisman Trophy winner Robert Griffin III. You will be able to put RG3 on one of the six teams included in the demo, and experience for yourself the new Total Control passing system. You can also check out the all new Reaction Time feature which gives you the ability to “slow the game down” and take the time to make the split-second decisions that came so natural to these Heisman greats. Dynasty ExperienceWith the addition of ESPN Studio Updates and the Bottom Line ticker to Dynasty Mode, we wanted to give you a feel for how the stories of the day will be revealed to you depending on when your game is being played. To do this, we are going to drop you into a Dynasty that has been simmed to week 10 of the upcoming college football season. We chose week 10 for two very important reasons, Oregon @ USC and Alabama @ LSU. Since both of those games are played in week 10 it was the natural choice for our Dynasty experience week. With RG3 being playable in the Heisman Challenge it also felt right for us to select Baylor as one of the teams in our other matchup, and we opted for Kansas State as Baylor’s opponent.When you select the Dynasty Experience from the menu you will be brought to the schedule screen where you will have the ability to select any of these three matchups. Each one is at a different time of day so that you will get to experience the “stories of Saturday” from three different perspectives. Once you select your game it’s time to head in and check out all of those new gameplay improvements like Total Control Passing, Read and React Defensive AI, and more. Not only that, you can also follow all of the action around the country through the Bottom Line and Studio Updates with Rece Davis. Heisman Challenge UnlockAs a reward for checking out the demo, we are going to give you three Heisman Challenge athletes for use in the full retail version ofNCAA Football 13. By completing each of the three demo matchups (either through the Heisman Challenge or the Dynasty experience) you will unlock classic Heisman winners Jim Plunkett, Tim Brown, and Archie Griffin. Now that you’ve got the details, go download that demo and start enjoying your first hands-on peek at NCAA Football 13. Be sure to preorder the game, and get ready for the full experience on July 10th. 1. On the Cross Menu Bar (XMB) of the PlayStation go to PlayStation Store icon under the account menu option (the second column from the right). 2. Once you select this it will load you into the PlayStation Store. 3. In the Store Menu go to PlayStation Demos option to get a list of demos. 4. Here you should see a list of demos that are currently available to download. Note: This could be broken into sub sections like Action/Adventure, Sports, Racing, etc. You want to pick “Sports” or “New”. 5. Here is where you can find the NCAA® Football 13 Demo and can select it. 6. In this screen select the demo and choose to download the file which will be free and install it. 7. Once the install is done to access it you need to go back to the XMB. 8. On the XMB go to the Game column (fourth from the right) and you will an NCAA® Football 20th Anniversary logo that is the new demo. I'm able to see NCAA 13 under demo in XBL but no option to download. Is this the big announcement during e3? That's got to be the big announcement. I guess still 2 minute qtrs? Yes. Originally they expected that the demo wouldn't be available for another couple of weeks but it went through certification faster than expected so they were able to share it earlier than expected. Congrats to JSmith03 being the lucky guesser... you've won a free month's worth of XBL Silver on behalf of TGT. Great news! I'm looking forward to it. When they jumped into the LSU-Bama game there was 2:14 left in the qtr so it's at least more than 2 min. Yeah I'm definitely interested to see how the passing & trajectories look - hopefully the gameplay is clean! That will be nice, VERY nice!! ...they are usually 2 minutes right? Supposedly it's available now on XBL, though their marketplace website doesn't reflect that. I thought so, I'm gonna shoot off an email to see if I can find out. We all know you guys make bank off of this deal! Assumption regular times for the store. Tonight on PSN, tomorrow morning for XBL. But as you know during E3, the respective stores can do multiple updates throughout the week. Not available on XBL yet. 10, 11, and 12 all there, but no 13. GREAT news! Glad to get the demo always and see whats in the DRAFT NCAA 13! Also, the Heisman mode game is 4- 5 min qtrs but you supersim defense. Demos on XBL go up at 5am EST on Tuesdays. I see NCAA but it doesn't have an option to download. Boo.